Hand-made with fresh whole milk from the Alpine Valleys that encroach the Swiss-Italian border, Gorgonzola Prelibato is aged just 8-12 weeks to develop a soft, unctuous paste with blue and green veining from the penicilium, adding to the flavor and texture of the cheese. Caseficio Pedretti makes two variations of Gorgonzola Dolce, Prelibato and Marca Oro. Similar to Marca Oro, Prelibato curd is cut smaller , salted more, and aged at a higher temperature than Mara Oro. These methods produce a tighter, slightly drier curd which is easier to handle and holds up better than its creamier cousin. We especially recommend Prelibato for cheese counters with a precut program or food service programs. Founded n 1927, Ciresa is the key affinatore of Lombardy cheeses, their central range reflective of the cheeses of the historic land of Lombardy. 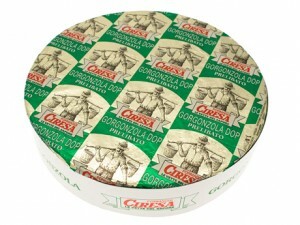 They work closely with their producers to ensure the cheese is make to Ciresa’s specifications. While most of Ciresa’s affinage occurs at the main office in Introbio, Ciresa has a special location in Novara for the care and aging of Gorgonzola. The production of Ciresa Gorgonzola is carried out in a peculiar place: the dairy is situated in a national nature preserve. This family of master cheese makers have worked in this dairy for more than 50 years, and have worked hand in glove with Ciresa the entire time. They receive one milk delivery per day , dividing that milk into two batches. They have twin 3000L vats in which they make between 200 – 250 wheels of cheese each day, with almost daily pick- ups from Ciresa. No salting is done at the dairy; this is left for the affinatores at Novara. PROFILE Gorgonzola Prelibato is unctuous and velvety, but with a much sweeter and complex flavor profile due to its bright, pocketed blue veins. The mild nature of the cheese allows it to pair well in both savory and sweet applications.